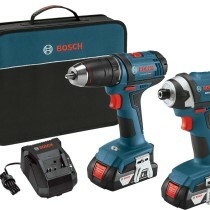 I found you guys a pretty good deal for a Bosch 2 tool combo kit with compact tough drill/driver and a 1/2″ socket ready impact driver (the newer brushed model) with a couple of 2.0ah batteries, charger and tool bag for $149 with free shipping! Click on the buy now link below to take advantage of this deal. Shipped and sold by AcmeTools. I don’t know how long this deal will last but one thing’s for sure, it wont last forever. 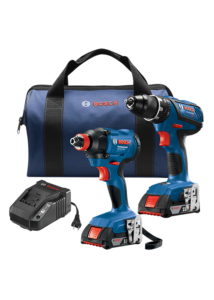 The Bosch GXL18V-232B22 18V 2-Tool Combo Kit features two tools designed to deliver professional cordless drilling and driving performance. The GDX18V-1600 Bit/Socket Impact Driver has a two-in-one chuck that combines a 1/4 In. quick-change hex shank with power groove for bits, with a 1/2 In. square drive for sockets. Its motor produces up to 1,600 In.-Lbs. of torque. The DDS181A Compact Tough 1/2 In. 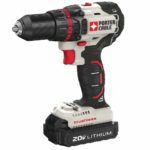 Drill/Driver has an upgraded metal chuck, and its motor delivers the same power as conventional 18V motors in a more compact size. It produces 600 In.-Lbs. 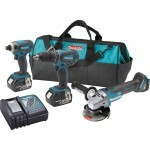 of torque and two drilling speeds (0-1,900 rpm for high speed and 0-500 rpm for high power). This kit includes two 18V 2.0 Ah SlimPack batteries and a charger.